Back in 1864, Glomeropitcairnia penduliflora, the subject of our cover illustration, was first discovered by Dr. John Imray, a native of Scotland, who had been, for nearly half a century, resident physician of the island of Dominica, B.W.I. Being the primary plant collector of Dominica he was the first to find this most unusual bromeliad; it was published in Grisebach's "Flora Brittanica" in 1864 as Tillandsia penduliflora. Only two species of the genus Glomeropitcairnia are known. G. penduliflora from Dominica and Martinique, and G. erectifolia from Trinidad and the Venezuelan island state, Isla Margarita. 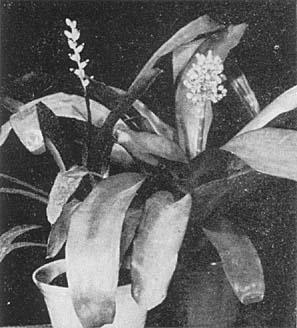 The plant in the cover photo is one of G. penduliflora which the writer has raised from seed collected in Dominica in 1940 by Mr. W. H. Hodge. The plant, now almost sixteen years of age, is nearly six feet tall but has not yet shown any signs of flowering. It is a magnificent specimen, yet, although we are most anxious to see it flower and have been looking forward to it for sometime, we are very much afraid that it will perish after flowering and maturing its seeds, as do quite a number of the very large species in the Tillandsioideae subfamily. When this plant was four years of age it began showing very small seedling-like offshoots at the base but now that the plant is nearer maturity, we do not find that any more of these plantlets appear, and therefore we can expect it to succumb entirely after flowering. Mr. Hodge, in his "Flora of Dominica, B.W.I." which appeared in Vol. 17, March 1954 No. I and in Vol. 17, June 1954 No. 2 of LLOYDIA, gives a very interesting account of his explorations there. He explains that this G. penduliflora is found only in a few spots where it grows epiphytically in the canopy of the mossy forest zone on the higher peaks where the rainfall exceeds 350 inches per year. When in bloom the inflorescence reaches a height of ten feet producing many branches of lateral spikes which send forth pendent flowers. The plant has a leaf spread of six to eight feet. These breath-taking proportions make it a spectacular bromeliad, well worth the long period of growth from seed to maturity; in fact, its firm, blue-green strap-shaped leaves make it a beautiful decoration even if it never produced an inflorescence. It is one of the proud displays which first greets a visitor upon entering the BROMELARIO in Orlando, Florida. In 1951, when the writer collected in Venezuela, several days were spent on Isla Margarita, an island state just off the coast of Venezuela. While this is quite a dry island, with but little rainfall, there is a very narrow strip of canopy matted growth on the top of San Juan mountain, 2000 feet above sea level. Here the trees, in what could be called an elfin forest, are eight to twelve feet high; their matted tops are so closely woven that it is necessary to push one's body up through the branches and stand on this matted carpet of miniature tree tops, in order to survey the sea or surrounding territory. Here on the tops of these trees I found Glomeropitcairnia erectifolia growing quite contentedly in this windy, misty cloud-bathed area. There were several other epiphytes, such as orchids, mosses and hepatics, but few were found near the ground under the canopy. The thickness of this tangled growth of dwarf tree trunks and lianas could easily discourage anyone from trying to cover much distance through this fantastic elfin forest growth of Clusia trees. It had been formerly thought, and so published by Mez and others, that the seeds of the Glomeropitcairnias had plumose appendages on both ends. 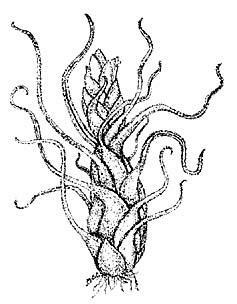 But when I collected and examined many fresh seeds I found them to have only a basal plumose appendage with an apical thread-like appendage. 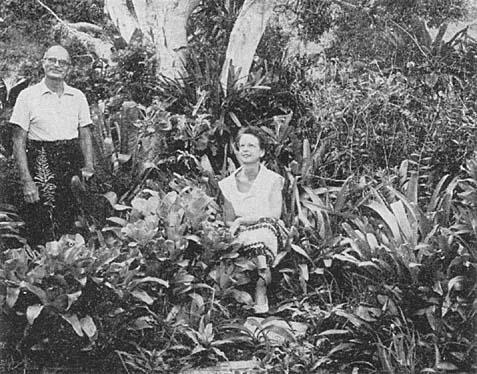 Mr. and Mrs. W. W. G. Moir in their Hawaiian Island bromeliad garden. Leading up to the mountains from the business center of Honolulu is a valley called Nuuanu, Noo-oo-a-noo, with equal value given to each syllable. It is a main valley and the only one that a road traverses to the top. There the road threads through a narrow gap in the mountains. At this point, and at right angles to the road, the earth drops abruptly in a vertical precipice called the Nuuanu Pali. Until rather recent years the road ended right there at the drop-off. Now the road continues as a twisting, turning, mountain pass down the face of the pali to the windward side of the island. The trade winds funnel through the narrow gap in an almost everblowing blast. They blow down the valley toward Honolulu in gradually diminishing force, but with strength to bend the growth of trees and to rattle windows in their frames. These winds also bring a welcome coolness, and in the winter extra rain and dampness to Nuuanu Valley. This humidity makes wonderful growing conditions for orchids. About half way from where the ships dock in Honolulu to the Pali at the gap in the mountains live our fellow bromeliad society members, Goodale and May Moir (P. 0. Box 2298). Their pleasant home is a series of indoor and outdoor orchid rooms, of glass within and open lanais without. The orchids are everywhere, brilliant and gay, comprising selections from the choicest genera that are popularly grown in Honolulu, many their own hybrids, and a notable collection of botanical orchids of which the Moirs are particularly fond. A large lot of the last have been personally collected by them in the wilds of Central America and the West Indies. They were unable to collect bromeliads which might add to the beauty of their own gardens because of the general prohibition against the introduction of Bromeliaceae to the Hawaiian Islands–a measure of protection to the pineapple industry. This industry, with sugar production and tourism, is one of the three props on which the Island economy stands. But the Moirs do have a garden of bromeliads, consisting mainly of kinds that have found their way to the Islands over the years, and probably long before the day of plant introduction rules. This garden is at the upper and exposed end of their homeplace, where the wet valley wind hits first. In this location, and luxuriating, are such species as Aechmea bracteata, Neoregelia spectabilis, Billbergia pyramidalis, and Vriesia splendens. 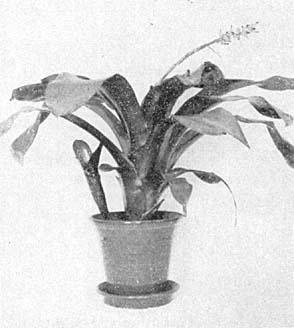 The Moirs were early members of the Bromeliad Society. They admire bromeliads and are most desirous of raising others from seed. The general collection of plants at their home numbers into the thousands and constitutes a maintenance task to which the two Moirs apply themselves willingly as a labor of love. In spite of the blowing of misty winds, there is a tremendous amount of manual watering to do. The Moirs are plant scientists who are keenly alert to new horticultural methods. When busily watering they are probably also feeding with carefully measured sugar solutions in combination with other nutrients, and perhaps there is liquid snail bait in the mixture too. When high in the Chiriqui Mountains of Panama last spring, Goodale and May found many beautiful bromeliads, and among them Tillandsia multicaulis that, spectacularly and simultaneously, bore five bright-red, Vriesia-like, flat spikes. These spikes do not emerge together from the center of the rosette of flat, ribbon-like green leaves, but instead, from out among the leaves in the precise geometrical pattern of the points of a pentagon. This wonderful bromeliad not only survived the rigors of the trip up to the States but also, in spite of a refusal to produce new roots of its own, produced a generous crop of shoots in the collection of the undersigned. Even though the Moirs could not take this plant on to Hawaii it is hoped that their generosity will have helped to introduce another decorative bromeliad to California as it has not been very successfully grown in other parts of the U.S.A. The illustration on the cover of our Bromeliad Cultural Handbook is a stylized drawing of T. multicaulis. 11977 San Vicente, Los Angeles, Calif.
We had been very successful with growing bromel seeds among our orchids and the moss on the tree fern logs but on our return from the 1955 trip to Central America, our third trip to that area, we did not find it so successful. So when we received seed of some choice crosses from Mr. David Barry, Jr., we took them to one of our very best orchid germinators and friends, Mr. and Mrs. Ernest T. Iwanaga. They had never raised these before and realized to raise them on agar like orchids would require such a fine sterilization of the seeds that they probably would not survive. They, therefore, made up a potting media of half peat moss (Oregon) and half sponge rock, thoroughly wetted the mixture in clean pots, then autoclaved the pot and mixture. The bromel seed was then placed in a solution of tersan (1 tablespoon in a gallon of water) with a few drops of a wetting agent called vatsol. The seeds were left two or three minutes in the solution. Tweezers were used to pick out each seed and place it on the surface of the peat-rock mixture. The mixture was at a level of about one inch below the rim of a five-inch pot of the medium height. Over the top of the pot was placed a glass cover. After green leaves began to show, the pots were watered with a weak solution (1%) of rootone–sodium naphthalene acetic acid. These pots have been kept on the same shelves as the orchid flasks and will be handled like them until they have their roots sufficiently developed. For the past year and a half, since the increase in the size of The Bulletin, we have been depleting the reserve supply of articles on hand for publication in the Bromeliad Bulletin. Don't you have some ideas on bromeliads that would be interesting to other people or which should be printed for the record? We would like articles on unusual features of gardens where bromeliads have been used or about any oddities that have occurred with your plants; have you any new ideas on the care of them? How do you use them as decorative plants or in dried arrangements? Have you read something elsewhere that should be reprinted and shared with other bromeliophiles? Good clear black and white photos or a drawing always add to the interest and are desirable. Can you make a contribution that will add to the general knowledge of bromeliads? Photo Robert Leahey, St. Petersburg, Fla. The Florida West Coast Bromeliad Society participated, by request, in the 8th Annual Florida West Coast Orchid Society Show held at the Municipal Pier, St. Petersburg, Florida from January 21st through the 23rd. Mr. M. B. Foster sent us a sketch of a shadow box arrangement which really appeared to be a considerable undertaking for a small group; nevertheless, we recognized the opportunity of staging something quite different from the usual bromeliad exhibit. Miss Dorothy E. Evans, president of our local Society, and I called on Mr. Foster in Orlando and were given full particulars pertaining to the construction of the shadow boxes and complete setting, along with a vivid sketch in color, drawn to scale. The Park Department and City Nursery furnished all the live background material of Areca palms and Cabbage palms with their boots on. Our local Society provided other necessary plant materials. The husband of one of our members, handy with tools, very obligingly constructed the shadow box arrangement which measured thirteen and a half feet long by seven feet high. The box interiors were painted various pastel shades of blue-grey, blue, yellow, peach, etc. The front rims of these niches were outlined in black which gave them a sort of picture frame appearance. Immediately behind this shadow box group, we propped against the wall, a frame, 30 by 8 feet, to which poultry wire was nailed. Spanish Moss was carefully woven through the mesh of the wire to give the effect of a soft-textured, neutral-colored curtain back-ground. 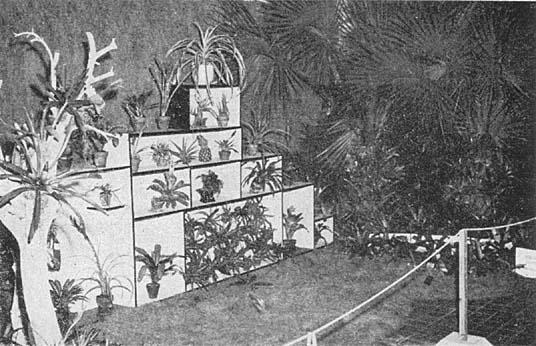 The various specimen plants were then placed in the niches; this was done rather successfully through the simple trial and error process. Many factors had to be taken into consideration such as: color of the plant and its inflorescence; size of both; color of the box and its height; the proper tilt of each plant in order to make the best possible showing. Mr. Foster's stunning Ananas bracteatus variegatus adorned the very top of the arrangement which was a sight to behold. The Cryptanthus hybrids were placed in the lower box wired on a slant to make viewing easy and attractive. The two mottled citrus trees were placed at an attractive angle to the left of the main display while the Cabbage palms, arranged in similar manner, were on the right. Native plants and several other bromels were attached to the citrus trees; bromeliads of all descriptions were put in the boots of the palms. The background material was arranged along both borders of our space in a semi-circle. The floor was covered with Spanish Moss. Plants from the genera Vriesia, Aechmea, Nidularium, Billbergia, Neoregelia, etc. were grouped on both sides of the large arrangement which gave the appearance of a beautiful garden. The sign "Bromeliads Are Beautiful" was placed on the left side in front of a log banked with moss and the name of our Society on the right. The main theme of our exhibit was to show how beautiful bromeliads are in both the home and outdoors in the garden. The exhibit was awarded a Blue and Yellow Ribbon. Many people remarked that it was the most outstanding exhibit in the entire show. Ensign and Mr. Julian Nally of Orlando. They complimented us upon the splendid appearance of the local plants. Miss Dorothy Evans was given a Blue Ribbon and Silver Trophy for the "Best Bromeliad" in the show; it was a stunning specimen of Neoregelia carolinae var. tricolor. Several other members received Blue and also Red Ribbons. This was the first year that the Florida West Coast Orchid Society awarded a Silver Trophy to a member of our Society which is quite an honor; also they obtained bromeliad judges for us. The bromeliads are rapidly gaining recognition. Many amusing comments were made, as usual. Some people thought bromels were orchids. One woman called Guzmania magnifica a Day Lily! Then there were those who thought bromels were Lupine! One or two hostesses were on duty daily during the show and, of course, answered all sorts of questions and tried to explain some interesting facts about the Bromeliaceae. The show was a huge success. 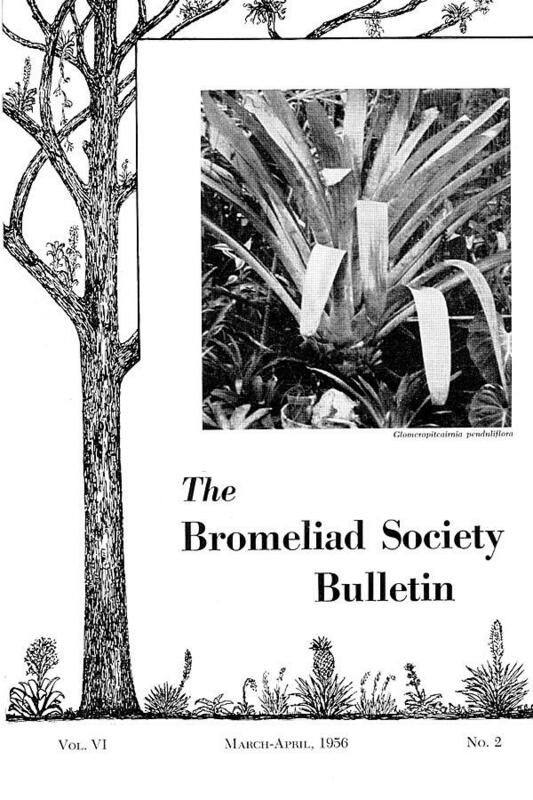 We distributed mimeographed descriptions of bromeliads and sold a good number of Handbooks. 2161 Fifth Ave. N., St. Petersburg, Fla.
A few notes on the colorful display of bromeliads by Robert Morobé at The Ghent Floralies in Belgium spring 1955 shows that the art of growing and displaying these colorful plants is still a very outstanding section of horticulture in Belgium where bromeliads have been shown in the finest exhibits for nearly a century. In this recent display, pictured above, the foreground was flat but heavily ruffled by tussocks of various aspleniums and other hard-leafed ferns, each of which contained a group of two or more of Mr. Morobé's truly magnificently grown bromeliads. Their colorful foliage showed up through and behind the pool of jungle plants, for many were fixed to tree stems and living plants, but most were distributed around the lower ground of the thirty foot frontage. 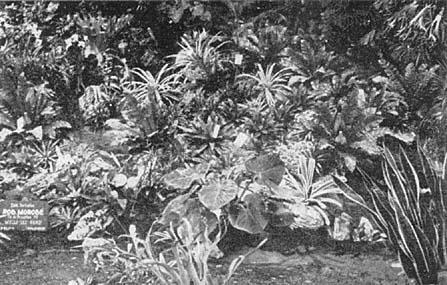 The bromeliads included Vriesia intermedia, V. hieroglyphica, V. Splendens major, V. viminalis, V. Poelmanii, V. psittacina and others. There were, of course, many Cryptanthus and pineapples as well as Neoregelias, Nidulariums and Aechmeas. A large, irregular shaped mass of slimy green water, broken up by a little island or two centrally, and by large fallen bromeliad-covered tree trunks, formed the central feature of this incredibly good group. The usual Eichornia and floating aquatics were most naturally massed on parts of the dank water. The ground behind this water sloped gently up to the right hand, and quickly to the rear into a jungle-like thickness of Monstera deliciosa and various heavy foliage plants including, of course, Philodendron. The highest point was greatly accentuated by a huge fifteen to eighteen foot Phoenix Roebelenii palm. The whole group was staged at floor level, an enormous advantage where the display of bromeliads is concerned and the flatness of the front was cleverly relieved, the Sanseverias helping greatly. Florida is blessed with bromeliads, that is, in comparison with other states in the U.S.A. Fifteen species and two varieties of the family have found Florida a favorable habitat–and no wonder; air conditioning from the Atlantic Ocean on the east and the Gulf of Mexico on the west give this state unusual moist atmospheric conditions, even if one doesn't count the thousands of lakes and rivers within the peninsula, all of which encourage an epiphytic flora. All but four of the nineteen bromeliad species native to the United States are growing in Florida. While other states, such as Texas, Georgia, New Mexico, Louisiana and the Carolinas, and even the southern section of Virginia can claim some bromeliads, Florida can boast of twelve Tillandsias, one Guzmania and two Catopsis species. Florida bromeliads have had to depend almost entirely on the wind for distribution. The ones we have, no doubt, came by way of Cuba and Mexico, as most of our native bromeliads are also found in these Caribbean countries. A close observer can see that it is the hardy, sturdy xerophytic Tillandsia group which is predominate in Florida. These Tillandsias can take the dry, hot days because of their natural protective coating of grey fuzz; they are, generally, more in the open areas than the soft, delicate-leaved Guzmania which hides itself in the deep Everglades; the two Catopsis also seek seclusion in the lower tip of Florida's fast disappearing natural forests of Collier County. It is interesting to note that the native bromeliads in Florida occur, principally, on oak, pine and Taxodium (Cypress) trees although the mangroves in the extreme southern area take their share, such as the two species of Catopsis. Doubtless the rarest of all the Florida native bromeliads is Tillandsia pruinosa. First discovered in Jamaica and named by Swartz in 1797 it has since been found in Mexico, Guatemala, Costa Rica, Cuba, Hispaniola, Venezuela, Colombia, Ecuador and Brazil. I have, personally, taken this plant in all but two of these countries, Hispaniola and Guatemala. For centuries this quaint, fuzzy little Tillandsia, which would charm any bromeliad connoisseur, has been living in the trees all over the Caribbean area, but it was first found in Florida, in the Big Cypress Swamp, only in 1948 by Mr. Roy Woodbury, Prof. of Botany at the University of Miami, Florida. Just when the plant made its aerial trip to Florida, of course, is not known as it was undoubtedly before the time when all international air flights must be recorded. No doubt, it came by parachute (plumose seed) from Cuba or Mexico on the high winds of a hurricane. And was, undoubtedly, of rather comparatively recent migration as it has been found in only two localities where it is even now quite rare. This plant sends out many plumose seeds carried on silken hair parachutes and could become rather common once it found a suitable location, so it is quite possible that it may have been here in Florida considerably less than a hundred years. The little octopus-like plant appears as though it were covered with grey hoar frost. Pruinosa means hoar-frost or dew and when this plant is dry it certainly has the appearance of being covered with a lovely grey, dewy coating. However, when the plant is actually covered with dew it turns an olive green, just as do the other similarly coated species as T. usneoides and T. recurvata. While the plant is always interesting because of its grey coating and its nice shape, it is especially interesting when in flower because of its distichous spikes of rose pink bracts and purple petals with yellow stamens. This is one of the few Tillandsias in the United States that does not hold a quantity of water between the leaves; that, of course, accounts for the fact that it is heavily covered with lepidote scales which serve the purpose of catching the moisture from rain or dew. The leaves form a dense compact twisting mass; the base of the leaves clamp tightly around each other with the tips twirling in the air like the tentacles of an octopus. This plant was introduced into horticulture in 1875 by M. J. C. Houzeau who had lived in Gordon Town, Jamaica and who sent it to the horticulture establishment of MM. Jacob-Makoy in Liege, Belgium where it flowered for the first time under cultivation. Bromeliads have made another cover page in color. This time in New Orleans on the cover of the DIXIE Roto Magazine of the Times-Picayune of March 4th entitled, "Newest Fad in House Plants." It includes excellent color photos of the dynamic Aechmea recurvata with three smaller cuts of Billbergia pyramidalis, Ananas comosus (a depauperized individual) and Tillandsia cyanea. Credit goes to Morris H. Hobbs, President and Eric Knoblock, Vice-President of the Louisiana Bromeliad Society both of whom furnished the color shots and the information for this full page cover and the full page article on our favorite plants. A reproduction of Mr. Hobbs' prize winning etching of Vriesia splendens is also shown. The Louisiana affiliated Society is made up of a very enthusiastic group and they have done much, in a few years, to make these plants more popularly known. Although most of the papers concerning Tillandsia species in North America have listed Tillandsia incurva as native to Florida, I doubt very much the possibility that this Tillandsia could live as a native in our state. I have collected this plant in Venezuela, Colombia, Costa Rica, Cuba and Jamaica, and it also has been found in Bolivia. But in every locality this species has inhabited mountainous, high altitude cloud-forest areas where the trees are covered with mosses, ferns, orchids, bromeliads–all an epiphytic flora of the humid forests. That Tillandsia incurva prefers the high altitude cloud-forest is borne out when it refuses to survive the low altitude of Florida's climate on the several occasions when I have tried, without success, to persuade it to live in our conditions. Therefore, I have reason to doubt the validity of the herbarium specimen (taken in Key West by Blodgett) which gives it a Florida Keys location. It is possible that this collection location has been confused with some other locality in the close by Caribbean area. In spite of all the intensive collecting of bromeliads in South Florida during the past few years, this species has never been taken. 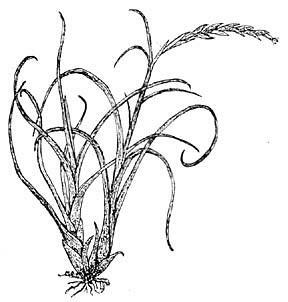 Two more Tillandsia species, credited with Florida native residence, are T. juncea and T. festucoides. These two species have been reported by Carl Mez (in Das Pflanzenreich) as being native to Florida, but we are of the opinion that these reports might have been misidentifications. I have taken the above two species in several countries of the Caribbean area; also, I have living plants of T. juncea which I collected in Jamaica, but know of no report in recent years where these two species have been taken in Florida or anywhere else in the U.S.A. 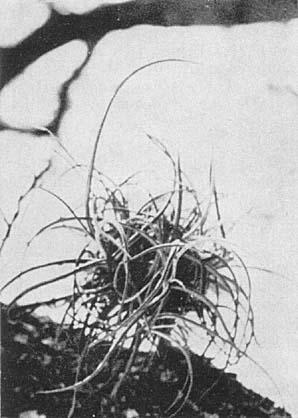 It might be added, however, that it is strongly suspected that in not too great a future time there will be several Tillandsia species, as well as bromeliads in other genera, found growing "wild" in Florida, for they will escape from the many naturalized public and private garden collections throughout the state, such as The Fairchild Tropical Gardens at Coral Gables. McKee Jungle Gardens at Vero Beach, Caribbean Gardens at Naples, Cypress Gardens at Winter Haven, as well as many others. Some of the bromeliads will surely "go native" even as other bromeliads have already done so. There are but two states in our country where the plant family Bromeliaceae is represented by more than one genera. Spanish moss, (Tillandsia usneoides) is found in a half dozen of our Atlantic seaboard states, as well as the Gulf states from Florida to Texas, but only Florida and Texas contain other genera than Tillandsias. We had visited most of Florida in two successive years, from Tallahassee down through the state to the Everglades, and even through the keys to Key West on the Overseas Highway, and had found all but one or two of the rare species found only in the Big Cypress Swamp, which is inaccessible to the public. So in the fall of 1954, we started a discussion as to where to go on a trip which might possibly yield a few bromeliads. Texas was our first thought, as both Hechtias and Tillandsias have been found there. A map of the state showed a large National Park located on the Rio Grande River in the Southwest corner of the state, so we began to collect information on the possibilities of a short stay there. Surprisingly, none of us had heard much about Big Bend National Park, as it has been open to the public only ten years, and a great deal of road work was necessary before it could be easily visited. The park, as its name implies, is located on a big bend of the Rio Grande River, and contains several mountain ranges, the highest and most scenic being the Chisos mountains. Another but completely different type of mountain occurs along the eastern edge of the park, and extends on into Mexico. This is Sierra del Carmen range. Big Bend National Park comprises some 700,000 acres, extending for a distance of approximately seventy miles east and west, and eighty miles south of the nearest Texas town of Marathon. Very little information was available about the park, except that there were cabins and food supplies to be had in the Chisos Mountain basin, a high level valley (5500 ft. elevation) surrounded by the mountains. We wrote and arranged for cabin reservations at the government-controlled concession, and started the trip west, hoping it wouldn't be too rough. Cluster of Tillandsia Baileyi as it grows natively. We were pleasantly surprised to find the roads all in fine shape, and were led into a lovely log and concrete cabin roofed with red Spanish tile, which was to be our home during our stay in the park. We had expected temperatures below freezing at night, had even put anti-freeze in the car. It wasn't necessary, for the night temperatures rarely went below fifty, while during the clear sunny days, it rose to between seventy and eighty degrees. And this was the first week in December. A "chuck wagon" took care of our food requirements well and often, even to putting up lunches for us when we expected to be out in the mountains all day. A "trading post," the one bright spot after dinner, handled a supply of mountain gifts, books on the plant and bird life of the park, as well as a complete line of cameras and films. The first evening, a quiet mountain lad appeared at the Post who turned out to be the "Dude Wrangler," and we immediately made up a party to go on a horseback trip the next morning with him. Several trips were available, to various spots of interest, some of them in the highest part of the Chisos Mountains, 7800 ft., which on foot would have taxed anyone but an experienced mountain climber. Several members of the group showed a reluctance to sit down the next day, but then some of us had not been on horses for many years. Here we found dozens of plants, birds and trees that are found nowhere else in the country. The little Colima warbler is seen only in the Chisos Mountains, and there only at elevations between 5000 and 6000 feet. An interesting agave grows well up in the mountains (Agave scabra) a low stubby plant with rigid spinose leaves, which are also spine-tipped. This agave grows to a height of only two feet, but the inflorescence shoots up to fifteen feet or more. Like the bromeliads, the blooming plant gradually dies, but not until it has sent forth a multitude of tiny offshoots all around the base. Another small agave (Agave chisosensis) carpets the ground in some areas with its spiny cylindrical leaves. There are six species of yucca in the park, one of which, the giant dagger is Yucca carnerosana. T. Baileyi, a single plant. The Rio Grande River has cut through the volcanic rock of the mountains to form several beautiful canyons, among which are Boquillas, Santa Elena and Mariscal. The first two can be reached by good gravel roads, with only a short walk and climb into the canyons. Road work is progressing rapidly throughout the park, and soon all the scenic points along the river will be easily accessible. Climbing into Boquillas canyon, we found our first bromeliads, great masses of spiny Hechtias scattered over the sunny slope of a rocky hill. Dried leaves and blooming stalks were sent to Dr. Lyman B. Smith, Associate Curator at the Smithsonian Institution, Washington, D. C., who promptly identified it as Hechtia scariosa. This species was discovered on the same hillside in 1901. We looked for others throughout the park, and the only other spot they were seen in was a similar hillside in Santa Elena Canyon. These were all in locations well above the surrounding terrain which was typical cactus desert, including several varieties of Opuntia, Ocotillo, strawberry cactus (Echinocereus stramineus), as well as a number of species of Agave, including several that are not found away from the Chisos Mountains. We suspect that Big Bend National Park will soon become a very popular spot. It is not only a scenic wonderland, with a wide variety of elevations, from the low desert up through the hardwood timber forests to the highest part of the mountains where Ponderosa pine, Douglas fir and Arizona cypress grow, but intensely interesting to students and research workers in biology and geology, not to mention both professional and amateur photographers, who invariably run out of film long before they run out of subject matter. After five lovely days in the park, we reluctantly started down along the Rio Grande toward Brownsville, then to turn north along the Gulf of Mexico toward Houston. We had still to find Tillandsia Baileyi. Native of Mexico, we thought perhaps we would find it near the border. We watched for it as we turned north from Brownsville as it had been reported previously in this area. Plenty of ball moss (Tillandsia recurvata) was seen, always in live oak trees along the highway but no other type was visible. And, then, at Armstrong, Texas, we stopped at a roadside picnic area, in which there was a small grove of live oak trees. All of us immediately started to search the trees for signs of a "different" Tillandsia. Finally we saw what appeared to be an unusually large ball of T. recurvata, and a look through field glasses disclosed the fact that here was our Tillandsia Baileyi, well camouflaged by its similar cylindrical habit of growth. An accompanying photograph shows a cluster which proved to be ten or twelve individual plants, extending out in all directions from a common center. Identification was later confirmed by both Mulford B. Foster and Lyman B. Smith, to whom I had sent plants. Unlike most other Tillandsia, no maturing inflorescences were visible on any of these plants, although one has since started to grow and is now 6" above the ends of the leaves. We had probably seen it before without recognizing it as anything different from the ubiquitous ball moss, which often grew so thick one couldn't see the branches. However, it certainly is not common because we did not find it again although we stopped hopefully many times afterwards at groves of live oaks without finding another specimen. Our quest, however, had been fulfilled. We did find two varieties which Texas alone offers, justifying our 2500 mile expedition. Then, too, we did have an awfully good time. 628 Toulouse, New Orleans, La. Aechmea × "Royal Wine" M. B. Foster hybr. nov. This new hybrid was made in 1946 and first flowered in 1950; it is a striking improvement in both size and color on either of the parent plants. Both of these parents are "discolor" variety plants, having leaves that are green on the upper side and bronze-red below. The resulting hybrid "Royal Wine" carries this same discolor character but with intensified brilliance to the extent that the leaves appear almost as though they were artificially treated with a polishing wax. The leaves are strap-shaped and are one and a half to two inches in width at maturity, resembling the leaves of Ae. miniata var. discolor in conformation and not channeled as in Ae. Victoriana var. discolor. This new hybrid is much more vigorous in growth than its parents and when grown in good, full light is a really outstanding plant. The inflorescence, which may be simple or slightly branched, more nearly resembles that of Ae. Victoriana var. discolor in form and position being semi-pendent, but the flowers are larger and lighter in color. New growth offshoots appear soon after the inflorescence has ceased flowering. They appear on short stolons of one or two inches in length. The first leaves that appear are deep cherry-maroon, in color, on both sides, but the more mature leaves show the "discolor" combination as they develop in size.